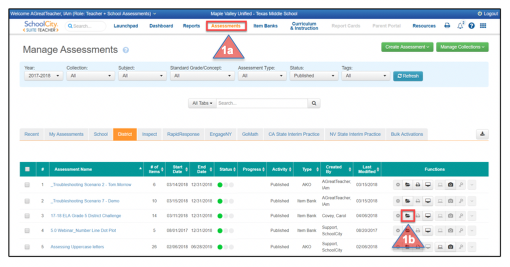 When an Item Bank assessment has been published, a PDF of the assessment is automatically populated in the Assessment Manager, and can be printed for teachers, students, or other users. For AKO and Express assessments, if a PDF of the assessment has been uploaded in the Setup step of the creation process, it will be located in the Assessment Manager. Supporting documents can also be uploaded and printed for all targeted audiences. From the Top Menu Bar, select Assessments (1a). Find the published assessment you wish to print in the list below. In the row with the assessment name, click on the open documents folder icon under Functions (1b). Item Bank assessment: The PDF of the Student Booklet will be shown on the right, along with a Summary document on the left. The Summary document contains a summary of the items on the test, aligned standards, DOK levels and Blooms Taxonomy levels, the answer key, and the assessment as it would appear to the student with the correct answers indicated. For primary grades teachers, a Teacher Booklet with instructions will also be available. To view, download, and print, click on the name of the desired document. Online AKO or Express Assessment: The PDF of the assessment that was uploaded during Setup step of the assessment building process will be shown. To delete a document, click on Remove file. Upload a supporting document to print and distribute to your target audience by clicking in the open space inside the dotted lines of the View/Upload Documents window. Select the desired document from your desktop and click Open. The document will appear next to the assessment documents. The additional doc or image will appear with a green checkmark. At any time, it can be printed along with the other assessment documents. Now that you have learned how to print test booklets, learn how to Printing Answer Sheets. Ready for more? Check out Randomizing Items and/or Answer Choices on Online Assessments!